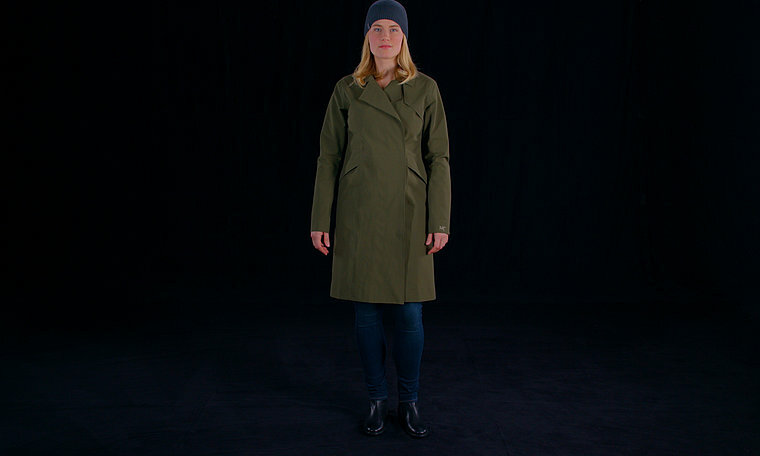 Waterproof, breathable GORE-TEX trench coat for bike commutes and city living. The double-breasted, knee-length Nila takes the trench coat’s urban appeal and updates it with GORE-TEX performance and a refined Arc’teryx aesthetic. The supple fabric is durably waterproof, windproof and breathable, and has a cottony canvas texture. A unique zipperless snap closure seals out rain, and the back is ventilated for comfort. A reflective surface under the collar improves safety, then tucks out of sight when not needed.